Employee morale, customer retention, reputation building: those are the building blocks of any business, let alone a little deli off the corner of a street. You know what we’re talking about: those cute little businesses packing sandwiches for you and your crew. And perhaps you even deliver like Jimmy Johns! It’s the stuff dreams are made of. And it makes sense. You have an automatic customer base, plus your employees — when they’re on, they’re ON. The employee morale’s high in this industry. So it makes sense that promotional picnic baskets make a killing in marketing for all three of these factors. 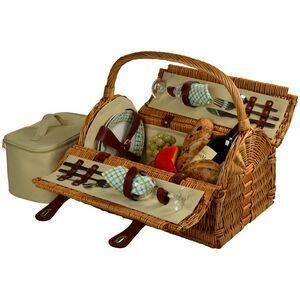 Who doesn’t need a picnic basket?? Stock up on those suckers through BRAVA Marketing, fill them up with your product, and you’ll have happier customers, happier employees — and, overall, a happier business. Think holidays, in fact. July 4th. Memorial Day. Thanksgiving. Christmas. It’s a way to keep your name out there in the best possible way — by giving a gift like that, showcasing your product. And your product, of course, is MEAT! Amazingly, none of the more established chains, we think, have caught on to the idea that you can jazz up the interest in your customers with these promotional picnic baskets, plus keeping your employees around in the same fashion. You can step out and offer that as a unique selling proposition and surpass all of them. Check out the designs we have right now! The selections will kill you. And then you can contact us immediately. We’ll get your next picnic party all squared away — whether you’re a deli, or an insurance company, or a plumbing contractor! It doesn’t matter. Everyone loves an awesome picnic.